Former Brazilian leader Luiz Inacio Lula da Silva is expected to accept a key ministerial role in President Dilma Rousseff's government, media reports say. Members of the governing Workers' Party say his appointment will strengthen her beleaguered administration. In becoming a minister, Lula will also have some legal protection. Last week, prosecutors requested his arrest in a money laundering inquiry over a luxury sea-front penthouse. The popular former president has denied any wrongdoing and says the claims are politically motivated. Why is Lula caught up in scandal? As a minister, Lula could only be tried by the Supreme Court, placing him out of the reach of the judge in the southern city of Curitiba responsible for the inquiry. Lula was briefly detained earlier this month after investigators said they had evidence he received illicit benefits from a kickback scheme involving state-oil company Petrobras. 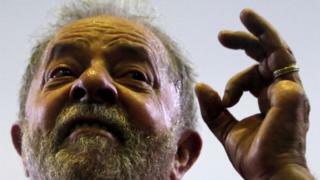 Media reports, quoting unnamed sources, said Ms Rousseff and Lula would meet in the capital, Brasilia, on Tuesday. There has been no official comment. Lula handpicked Ms Rousseff as a candidate to succeed him in 2010, and has not ruled out running again in 2018. Ms Rousseff has faced increasing calls for her removal as a result of a corruption scandal at Petrobras and Brazil's worst recession in decades. On Sunday, hundreds of thousands of Brazilians took to the streets calling for her to go. But the president has repeatedly said she will not resign. She could, however, face an impeachment process in Congress, accused of masking the budget deficit, which she denies. One of Lula's main tasks, the reports said, would be to negotiate with the main coalition partner in order to prevent an impeachment going ahead. Dozens of executives and politicians have been arrested or are under investigation as part of a massive corruption inquiry named Operation Car Wash. They are suspected of overcharging contracts with Petrobras and using part of the money to pay for bribes and electoral campaigns. One of the lines of inquiry is that construction companies targeted by the operation could have favoured Lula in the development of the same Guaruja flat that led prosecutors to request his arrest.